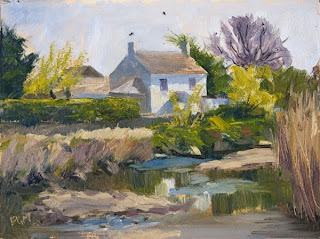 Cottage on the River Conder. Oil on gessoed card 6"x8"
Painted plein air, this subject was quite a challenge on such a small scale. I focused on the relationship of values around the white cottage as the sun cast a cool shadow under the eves and on the side wall. This was the first of two small paintings I finnished this afternoon.